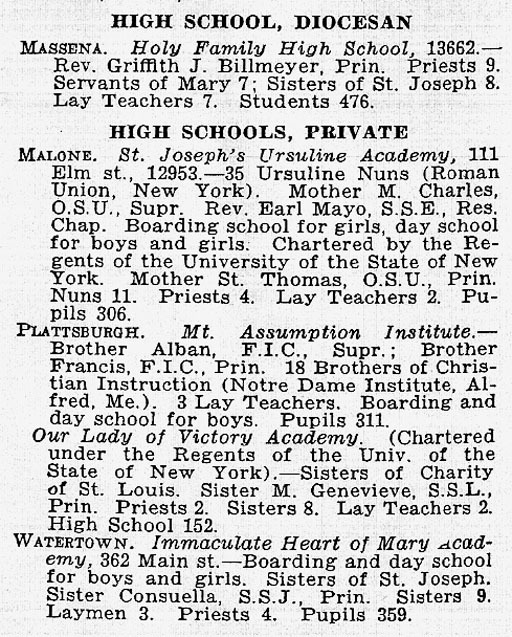 From Marion O'Connor: A school that closed: Vincentian Institute High School, Madison Avenue, Albany, NY . The Sisters of Mercy taught the girls and the Holy Cross Brothers taught the boys. It was open I think around 1920's and operated until maybe the 1970's. I graduated in 1948 and had 2 sisters and 1 brother who graduated after me. The nickname for the teams was the "Lions". 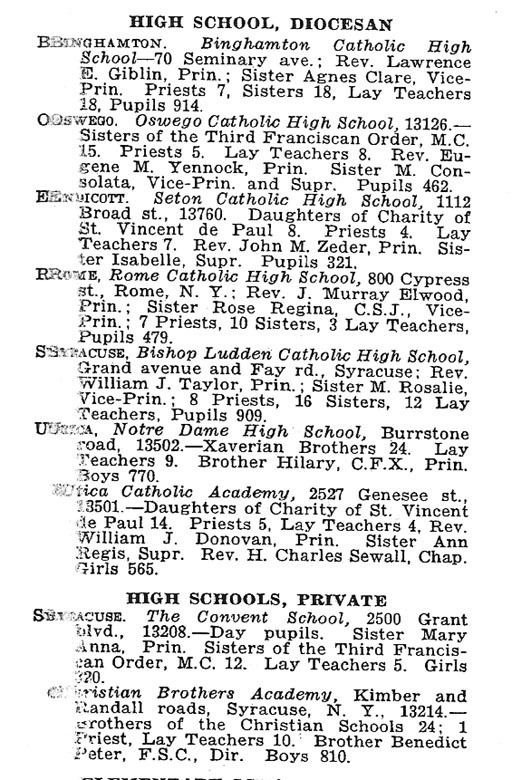 From Carla Mann: I attended St. Joseph's Academy on Lafayette St. in Schenectady, NY. 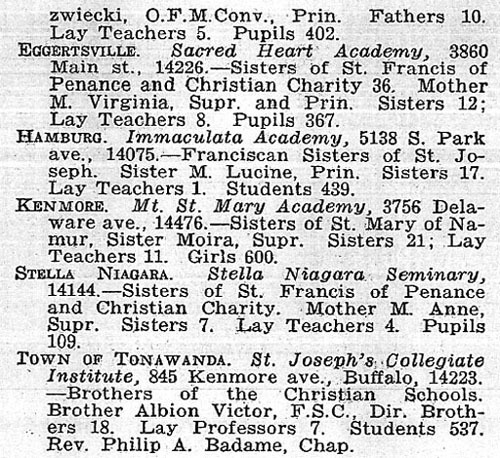 It closed around 1959 and some of the girls went on to St. Columba's, or to Notre Dame High School, both in Schenectady. 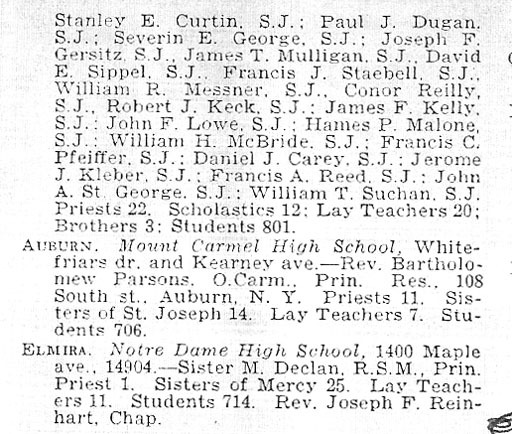 The boys went on to Bishop Gibbons' H.S. in Schenectady or other high schools in the area. St. Joseph's was run by the Sisters of St. Joseph of Carondolet and its Mother Superior was Mother Alvera. The pastor was Monsignor Schmidt. I believe St. Joseph's was built in late 1800s or early 1900s. The building is all gone now. I remember Bishop Dubois as it were yesterday. I entered this High School for the first time in the Spring of 1956 to take the required entrance examination for admission. On that day, I met Msgr. Buckley, principal, Fr. Fleming, Dean of Discipline and Fr. Fahey, Dean of Studies. I took the required exams. About one week later, I was notified of my acceptance. September, 1956 started one of the proudest four year periods of my life. I remember events such as Bishoop Dubois winning the National Championship for High Schools in the Spring of 1957 at the Penn Relays. Many Basketball tournments held at Mount St. Michael's in the Bronx in which our school won the Class "B" championships over Marist H. S. of Bayonne, NJ. 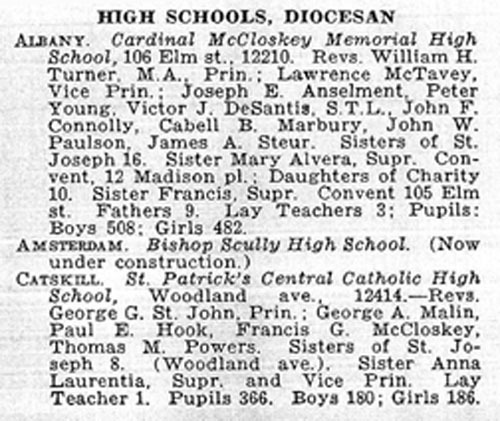 Division B of the Catholic HS championships in 1957,1958 and 1959. Plays, Field Trips, Academic Competition, Hops (Dances) but most of all I remember the Diocesan Priests and the Marist Brothers who gave of themselves to create men who came from parts of the inner city sections of Bronx and New York counties.